Using some simple math, you can figure out precisely what “inputs” you need to get the required “output” — your sales target! As a sales trainer and coach, the first place to start when growing sales results is to do some basic homework. The homework I’m speaking of is the analyzing of their current sales process including the number of key sales activities to produce one sale. We need to know what’s happening now in order to determine what improvements are needed. Activities – Are you doing enough of the key activities that drive sales? For sales involving acquisition of new customers, these typically include generating new leads through traditional or inbound efforts, making contact attempts, doing discovery meetings, presenting proposals, following up etc. Skill – Do you have the required skills in the various required areas? Do you know how to engage a potential customer with a clear, concise and compelling message? Do you know all the steps in a discovery meeting that will uncover the challenges, issues and needs of the customer? Can you effectively move a customer towards a commitment? Do you handle all objections deftly? Attitude – A great attitude is required to sustain the above. Without tenacity, optimism and a willingness to continually learn, burnout often sets in. 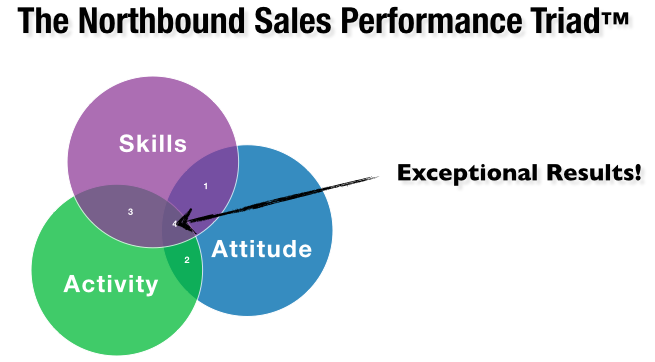 We call this the “Northbound Sales Performance Triad.” While attitude is difficult to measure, the other two components of the triad can be determined with a little effort. Sales is a process and like any process, it can be broken down into steps and each step can be measured. And just like anything – improving your golf score, saving money or making more sales – things always get better when you measure them! Can you imagine trying to drop your golf score by only knowing what the final tally was at the end of each game? The first place to start is by “slicing and dicing” your sales process. This is also called a “funnel analysis.” Then track two things: the number of key activities you do and your conversion rates which are the percentage of activities that lead to the next step in the sale. If you haven’t tracked these things in the past and have no data, an easy way to estimate your funnel is to work backwards. Do your calculations on making one sale only. Ask yourself, “What key activity happens right before making a sale?” Often this will be presenting a proposal. Then ask, “How many key activities do I need to make 1 sale?” If you need to present 4 proposals on average to make 1 sale, then your closing rate is 1/4 or 25%. Keep working your way up the funnel asking the same questions until you get the top. You will then know approximately how many activities you need to make 1 sale. 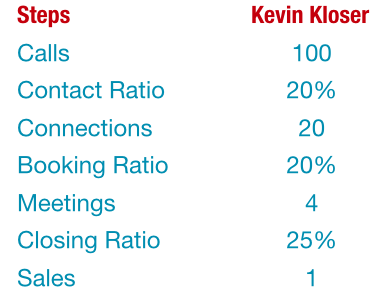 The top number could be the number of prospecting calls or leads required to make 1 sale. Here is a completed reverse funnel exercise for a very simple sales process. Having done this exercise with hundreds of people over the years, I can tell you that this number is often quite shocking! It’s not uncommon for salespeople to discover that their current activity level is terribly out of sync with their sales goal. Logically, if they keep doing what they are doing, it’s a mathematical certainty that they will miss their sales target. If you’re in this situation, you might ask, “What can I do about it?” don’t get too discouraged. I’ll discuss the “20% Solution” in my next blog post. If you or your sales team could use some help in mapping out a prospecting plan that will take you to your sales goal, check out our Power Prospecting workshop. Contact Michael for more details at mcaron@northboundsales.com or 416.456.1440.